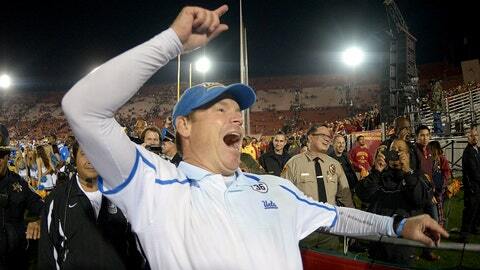 For Jim Mora and UCLA fans, there's a lot to be excited about looking ahead to 2014. What were you doing at 8:39 a.m. last Saturday? Maybe you were up with the kids, putting together breakfast. Maybe you were off somewhere running, lifting, ridding yourself of the toxins from a Friday night of excess. Maybe you were still asleep. You probably weren’t doing the same thing as UCLA coach Jim Mora, because he’s more awesome than most of us. Jim, how were you feeling Saturday morning? Hmm, I’m sensing a theme. Now, before you think Mora is looney at best or possessed at worst, you should know that he’s not actually holed up in a window-less office, foam pooling at the corners of his mouth, posting this stuff. He spent last Thursday sitting courtside with his wife at the UCLA basketball game, cheering on the Bruins against No. 1 Arizona. At halftime, he shook hands and socialized, and as the Bruins tried to close the gap in the second half, Mora did what most everyone else was doing: standing up, hands cupped around mouth, filling Pauley Pavilion with noise. So, yes, Mora is doing some non-football related things this offseason. He might be “desperate to win,” but he’s not insane (note: we didn’t confirm this with Mrs. Mora). These hunting tweets on a Saturday morning? This is just what it means to be a college football coach in the dark days of January. The routine remains, but the Saturday releases have gone in hiding for the next seven months. Mora’s a beauty, isn’t he? Hard to blame him for his excitement, with quarterback Brett Hundley coming back and a recently released schedule that includes Oregon, Stanford and USC all at home. August 30, UCLA fans, August 30. The Bruins will be in Charlottesville, Va., before you realize it.